The BBC's Bill Law was the only Western journalist at the meeting. In a hall crowded with conservative Sunni Muslim sheikhs and scholars, in a hotel close to Istanbul's Ataturk Airport speaker after speaker called for jihad against Israel in support of Hamas. The choice of Turkey was significant. Arab hardliners were keen to put aside historic differences with the Turks. As one organiser put it: "During the past 100 years relations have been strained but Palestine has brought us together." 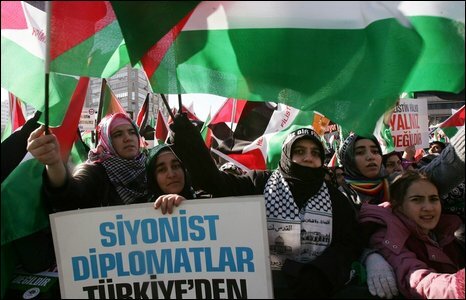 Many delegates spoke appreciatively of the protest by Turkish Prime Minister Recep Tayyip Erdogan, who stormed out of a Davos debate on Gaza two weeks ago. The conference, dubbed the Global Anti-Aggression Campaign, also gave impetus to Sunni clerics concerned about the growing power of Hezbollah, the Shia movement backed by Iran, which rose to international prominence in its own war with Israel in 2006. "Gaza is a gift," the Saudi religious scholar Mohsen al-Awajy told me. He and other delegates repeatedly referred to the Gaza war as "a victory". "Gaza," he continued, "gives us power, it solves our differences. We are all now in a unified front against Zionism." In closed meetings after sessions delegates focussed on the creation of a "third Jihadist front" - the first two being Afghanistan and Iraq. The intensity of the Israeli attack had "awakened all Muslims," Mr Awajy claimed. "Palestine is a legitimate theatre of operations for jihad (holy war)," he added. Mohammed Nazzal, a senior Hamas leader based in Damascus, challenged Arab governments to "open their borders and allow the fighters to come." Delegates from all over the Middle East, and from Somalia, Sudan, Pakistan and Indonesia applauded as he stabbed the air with a raised finger and declared: "There will be no agreement with Israel... only weapons will bring respect." Mr Nazzal told his audience: "Don't worry about casualties." 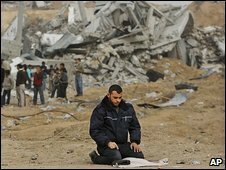 The 23 days of bombardment of Gaza, in which some 1,300 people, many of them civilians and nearly 300 of them children, are believed to have died, was "just the beginning" of the struggle, Mr Nazzal said. To laughter in the audience, another speaker noted that twice as many babies were born as children were killed during the war. Every death, I was told, was a martyrdom on the road to liberation. For the hardline sheikhs, it was an opportunity to underline what they see as the growing gulf between Arab regimes who are hesitant to back Hamas and the people of the region who, they say, embrace Hamas as heroes fighting against overwhelming odds. More importantly, this conference represented something of a coup for Hamas. They were promised weapons, money and fighters. The question remains whether such rhetoric can or will be translated into action. Israel keeps a tight blockade on the Gaza Strip, where Hamas exercises de facto control, and Israel's other borders are also heavily guarded. But at the very least this statement of intent from Sunni hardliners poses new challenges, not just to the Israelis and to Western efforts to broker a peace deal but to Arab regimes as well. Bill Law is a reporter for BBC Radio 4's flagship foreign affairs documentary series, Crossing Continents.